If you like live music, fun destinations and of course “blinged out” finishers medals mixed in with your running then the Rock ‘n’ Roll Marathon Series is for you. Their races offer a unique experience with live music at every mile, great crowd support and cheer zones to keep runners amped to the finish line, and a headliner concert after the race – past performers include the Goo Goo Dolls, Counting Crows, Chicago and Sara Evans. They’re also known for their “Heavy Medal” and reward participants with additional bling when they run two or more RnR races in a calendar year. The series has recently received some flack for logistical challenges with their Las Vegas race, but rebounded quickly with their final event of 2011, the Latin Music Miami Beach Half Marathon. 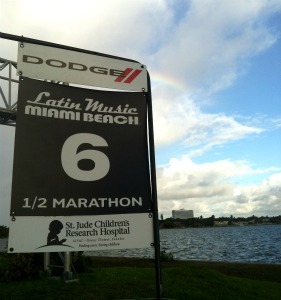 I’ve run two RnR races, Savannah in November and this past weekend in Miami, and had a fantastic time at both. 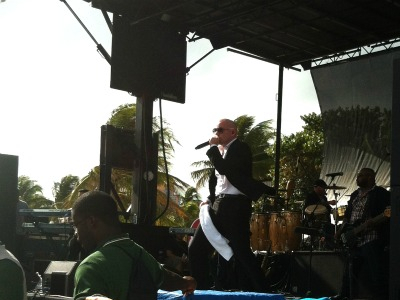 The Miami Beach Expo and the finish line were in the sand on the beach (I loved that), the course provided beautiful ocean views, and the headlining concert after the race was multi-platinum selling artist, Pitbull. Logistically the weekend went smooth – packet pick up was easy, the race start was on time and fluid, the water stops were well manned and stocked, and at the finish line volunteers handed out cold water and ice towels along with a pretty new medal. Miami rocked – pun intended – and I’m planning on running it again next year. For more information, visit http://runrocknroll.competitor.com/tour-stops. Disclosure: I received VIP tent passes in Miami Beach courtesy of the Competitor Group. I was not paid for this post, and as always, my thoughts and opinions are all my own. I will be at the Jun. 23, 2012 Seattle, WA. I am traveling from Illinois. So, excited to do a destination marathon. If anyone else is going, let me know. I’ve got 3 Rock n Roll Races set for 2012! DC in March, Savannah in November and Miami in December!! Can’t wait!! !